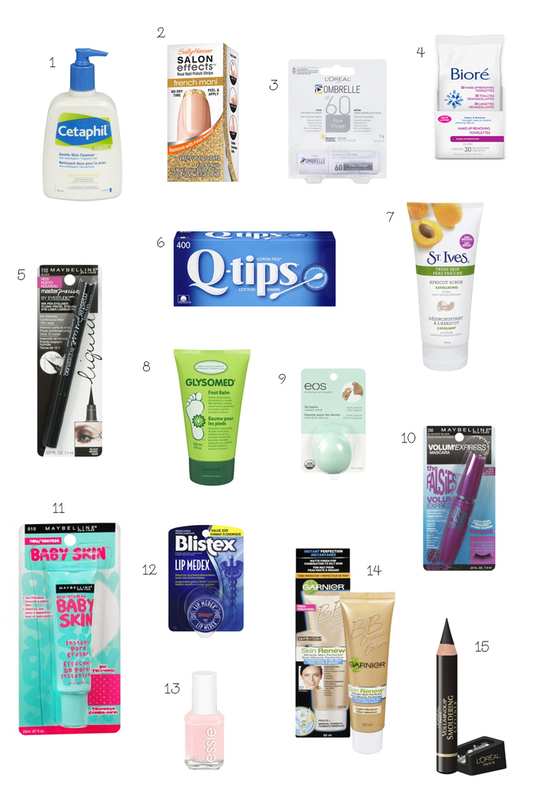 As much as I love shopping at specialty stores for premium beauty and make up products, I must say I still have a list of beauty staples that I obtain regularly at the local drug store/pharmacy. These products are a must have in my bathroom as they are all reliable, practical, and 100% affordable! As I’ve got fairly sensitive skin, I rely on Cetaphil’s Gentle Cleanser (I use the oily skin version) to keep my face squeeky clean. It’s totally hypoallergenic and a small pump goes a long way. My facial cleansing routine also includes exfoliation twice a week with St. Ives’ Apricot Scrub, I’ve honestly been using this for over 10 years both on my face and also all over my body after a day tanning in the sun. Speaking of sun, I also always have an Ombrelle Face Stick in my purse at all times, the stick is water resistant, goes on colorless and easy to apply, did I mention it is also SPF60?! Though the Ombrelle stick helps with sun protection on my face,however my lips get chapped with exposure to the sun, therefore, I will always count on my Blistex medicated lip balm. I believe I’ve got an addiction to Blistex … all year round. I’m positive you’ve got a list of Drug store/Pharmacy must haves, care to share by commenting below? I’m also pleased to share with you that HealthSnap offers an immense array of health and beauty products that can both be delivered to your home for free for purchases over $50 OR you can pick it up the same day at participating drug stores/pharmacies across Ontario (if order is placed before 10:00 a.m. EST). Event :: The National Women’s Show (TORONTO) GIVEAWAY!